Next Next post: Democrat Party! 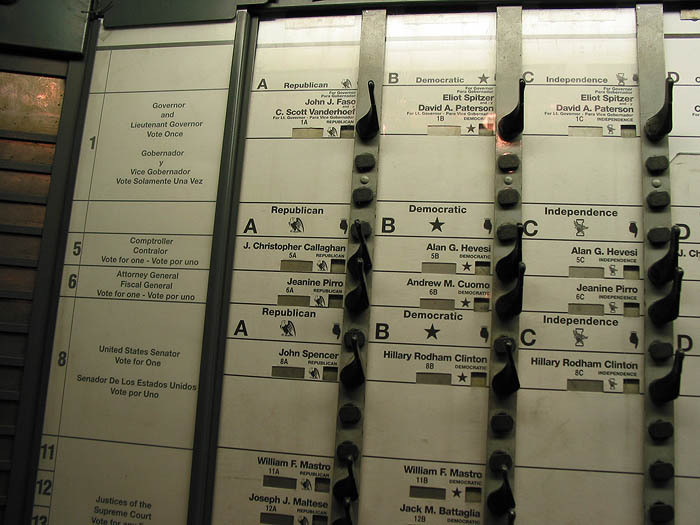 This is the last year in which gear-and-lever voting machines will be used in New York. From what I understand, these are the oldest voting machines still in use in the USA. They are over 50 years old in some cases, and are wildly prone to errors and malfunctions. Still, they’ve lasted 50 years — is it too high a standard to ask that whatever method of voting we switch to also be considered potentially useful for 50 years? I will fondly miss the ritual: Pull the big red lever to activate the machine, pull the little levers for the various candidates, then pull the big red lever back to register your vote. Feels like you’ve actually done something! I haven’t honestly done research on the voting machines that U.S. and A. uses, but I do not understand why there isn’t a consistent system implemented throughout the country. There are way too many versions and some are quite ‘hackable’. If an encrypted call to pay goods with a credit card works, why isn’t the government using a similar system? wow. i’ve never seen anything quite like that before! all the voting i’ve ever done has been on a piece of paper with a pencil. Steven: America’s voting patchwork is the result of our highly federal structure, where each state has their own state constitution and the right to run their state and local governments as they see fit. Technically, in fact, we have no national elections: each state determines in their own way how they will choose their Senators and Presidential electors. Some states until very recently chose their senators via a vote by the state legislature — that is, there was no popular vote for the Senate at all. I also think two other factors come into play: First, they want to control which voting machine manufacturer they will get their kickbacks from. Secondly they don’t want no federal government dictating to them how they will go about their own local disenfranchisement efforts. I’m not kidding: the South used to have pretty potent methods for denying the vote to blacks, and they fought hard to prevent the federal government from changing that. Leisa: Do your ballots get read by people or by machines (optical scan)? You’ll love this: Did you know that the modern concept of a voting “ballot”, where the candidates from all parties are listed next to each other on one sheet of paper (or on a machine’s interface), was originally invented in Australia and is called the Australian ballot? In the old days, you’d arrive at the voting place and write the names down of the candidates you wanted, and drop that in the box. That evolved into “tickets”, where party members would hand you a single ticket with all of their candidates listed thereon, and you’d then drop that paper into the box. The Australian innovation was to eliminate all this and require voters to vote on a single standardized ballot sheet. So cheers to you! Ironically, the first state to adopt the Australian ballot was, in fact, Ohio. Absentee voting is the only way to go. well, I never knew that Australian voting methods had been so influential. How interesting! Our system is not without problems though – often the ballot papers get incredibly large and unwieldy!